Kuşadası is a town on the Aegean coast of Turkey, near the ancient city of Ephesus, 90 km south of İzmir and a short distance across from the island of Samos. 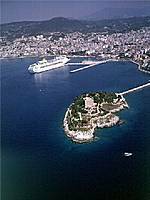 Kusadasi was a minor port overshadowed by Ephesus until Ephesus' harbor silted up. It was known as New Ephesus, Scala Nuova, and Kush-Adasi at the beginning of the 20th century. The name comes from 'kuş' (bird) and 'ada' (island). Just next to the old harbor is a small island that has a rock with the shape of a bird's head (as seen from the sea). Near to Kuşadası, there is a national park full of beautiful beaches just 1km ahead of the town of Güzelçamlı. Also, several aqua-parks are located near the town: the largest are Aqua Fantasy and Aqua Land.